LA LINEN AFFAIRS • 100% Cotton. • The 100% Egyptian cotton fabric is our perfect solution to luxurious and affordable bedding. The Cotton structure produces a soft, breathable weave that is stain and wrinkle resistant. • The fully elasticized fitted sheet guarantees a secure fit on mattress depths up to 15 inches. Sheet set is machine washable and tumble dry. • Available Size- 28"X75" Size. • 30"X75" Size • 32"X75" Size • 42"X80" Size • 48"X75" Size • Twin • Twin-XL • Full • Full-XL • Queen • Short Queen (60" x 75" • Short Queen • King • RV King • California King • Short King etc. • Solid/Stripe/Animal print Colors Available. 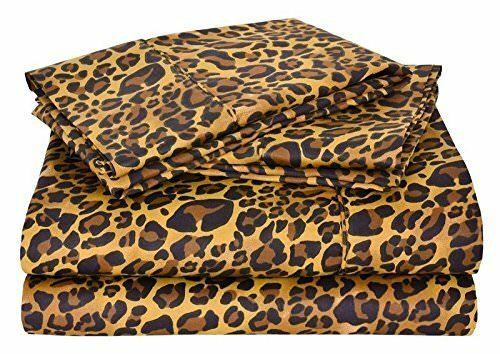 LUXURIOUS Sheet Set 15 inch deep pocket design in ALL USA Size, now with thicker, stronger elastic all around the fitted sheet. Each set includes 1 x flat sheet, 1 x fitted sheet and 2 x pillow cases. California King Sheet set measuring : (1) Qty flat sheet 102"x108" - inch , (1) Qty fitted sheet 72 X 84 - inch with 15 Inch Drop , and (2) Qty pillow case 20 x 30-inch. Elastic all around for a perfect fit. Cotton is hand-picked which puts less stress on the fibres, leaving them straight and intact. These fibers can be made longer to create very fine yarns which make it possible to make yarns without sacrificing the length, giving stronger and softer cotton, unlike regular cotton which has more splices. Care Instructions: Machine wash in cold water with similar colors. Tumble dry low. Do not bleach. SATISFACTION GUARANTEED - We are so confident in the quality of our product that we offer a 30-day satisfaction guarantee! If you are unsatisfied, simply contact us to return the product for a full refund. View More In Sheet & Pillowcase Sets. If you have any questions about this product by LA LINEN AFFAIRS, contact us by completing and submitting the form below. If you are looking for a specif part number, please include it with your message.